Description: The Brazilian Free-Tailed (Tadarida brasiliensis) bat has a dark brown to dark gray coat with wide ears that are far apart. It is 93 mm in length and weighs 11-15 grams. About Brazilian Free-Tailed Bat: This bat is the most well-known of North American bats with a population estimated between 95-104 million. Brazilian free-tailed bats in Texas are cave dwellers that live in large colonies, but they have also been known to inhabit buildings that have small cracks to provide shade from the sun during the day. The females will produce one pup, occasionally two, in the summer. 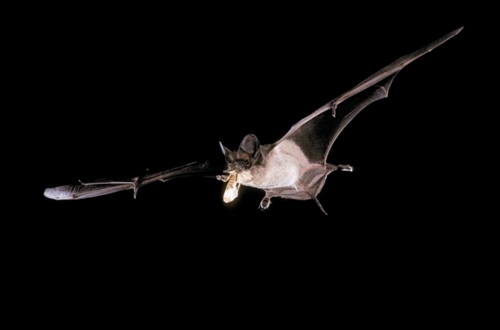 These bats eat primarily flying insects.